The candidates for the parliamentary poll are Congress nominee KL Chishi, NDPP candidate Tokheho Yepthomi, NPPs Hayithung Tungoe and Independent Dr MM Thromwa Konyak. 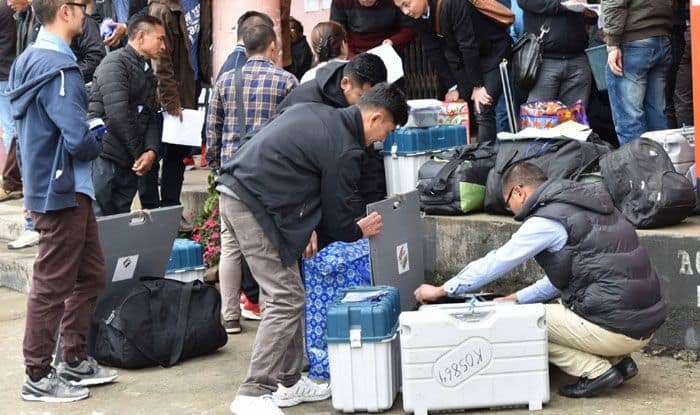 The Chief Electoral Officer (CEO) of Nagaland, Abhijit Sinha on Wednesday said all arrangements have been made for the smooth conduct of election to the lone Lok Sabha seat in the state on Thursday. The CEO appealed to the electorate to exercise their franchise for the Lok Sabha election and byelection to the Aonglenden Assembly seat without any fear and ensure ethical and informed voting. Sinha also urged the 12,13,777 electorates, including over 16,000 first time voters, not to be influenced by any inducement but to consciously use their franchise. Everything has been put in place for the conduct of peaceful polls for the lone Lok Sabha seat in Nagaland and the by-election to 26-Aonglenden Assembly constituency, he said. The CEO said all polling parties have left for their respective polling stations and are expected to reach the 2,227 polling stations spread over 12 election districts in the state. He said 75 companies of security forces including Central Armed Police Force, IR and State Police and Home Guards supplemented by over a 1000 village guards have been deployed in the polling stations. The by-poll to Aonglenden Assembly segment is a straight contest between the Congress nominee Alemjongshi Longkumer and Sharingain Longkumer of ruling NDPP. Aonglenden seat has a total of 12,436 electorates including 6,146 male and 6,290 female voters. Voting will be held on Thursday from 7 am to 4 pm.